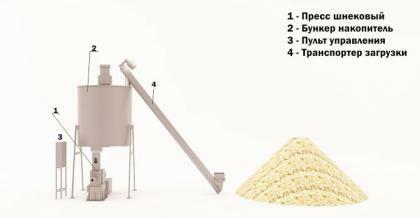 The Line without dryer 1500 - 2000 kg/h | СЗАО "БиоСтарИнжиниринг"
A good buy for your business! A first screw press with the capacity of 1500 - 2000 kg/h of finished briquette. At the moment there are no any analogues in Europe and CIS. This variant is the best for the dry feedstock with the moisture not more than 12%. The capacity may be increased up to 3 tons per hour by connecting one more press to the line. The screw can operate without restoring up to 50-100 tons of finished briquette (from sawdust, wood chips). If you want to process another feedstock, please, contacts us and make a request. And the die plate can operate up to 200-300 tons of finished briquette. Supervision of installation, commissioning and personnel training are included in the cost of the equipment. Three-year warranty is valid for the equipments. Different types of the feedstock are appropriate for pressing on the line: sawdust (wood chips), straw, sunflower husk, bagasse, lignin, buckwheat husk, cotton stalks. It's not the whole list of feedstock that our press can extrude, more details you can learn by contacting us. The press works with any tree species. Пресс шнековый до 1500 кг час. Пресс шнековый до 2000 кг час.